The back nine starts with a tee off the clubhouse ridge area. The slightly uphill landing area sits between two ridges, with a sand bunker to the left and depressions to catch any shot to the right. The green is one of the most severely guarded, with deep bunkers front and right. Another signature hole, this alternate route hole is an outstanding Par 4. A tee shot to the left fairway allows the most room for error; however, due to the angle of the green, the approach shot is very difficult. A drive to the right, while risky, takes 20 yards off the approach shot, and provides the welcoming angle into the green. 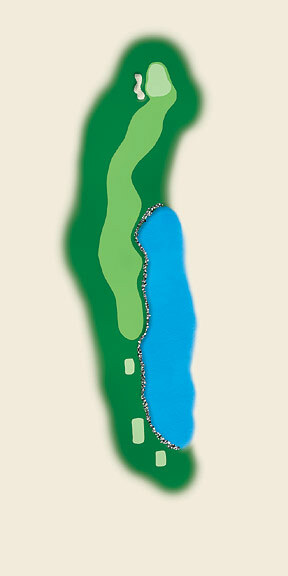 The green sits on a nose extending between two natural cutouts towards the shot maker. 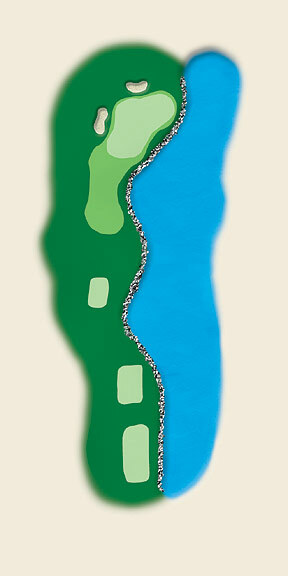 This split fairway Par 5 is a joy to look at, but difficult to play. The tee shot must be hit to stop short of the natural areas. From there, it is about a 100-yard carry to the second fairway. A large, deep bunker extends 60 yards out from the green and is sure to catch any shot to the right. 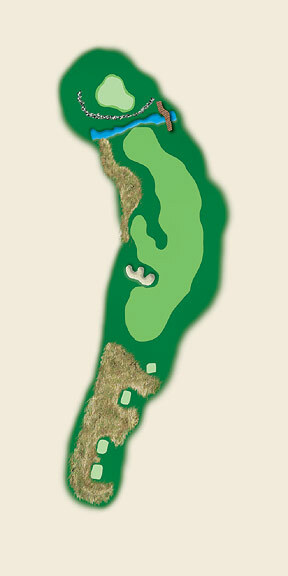 Teeing off adjacent to a five-acre lake is enough intimidation for this hole. The key is to look for the pin position. If the pin is middle or right, any shot in the fairway will do. If the hole is cut to the left, behind the bunker, the best tee shot is next to the water to have a better angle to approach the pin. 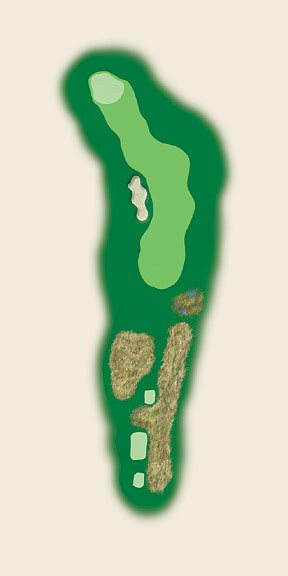 The third in a series of four outstanding Par 3�s is also the longest. What you see is what you get on this hole. The green sits by itself amidst the trees. Aim for the middle, but don�t be too short as you must carry the wetland. A shot missed left may end up 20 feet below the green. With the landing area guarded by a long, deep bunker on the left, the best drive is to the right side of the fairway. 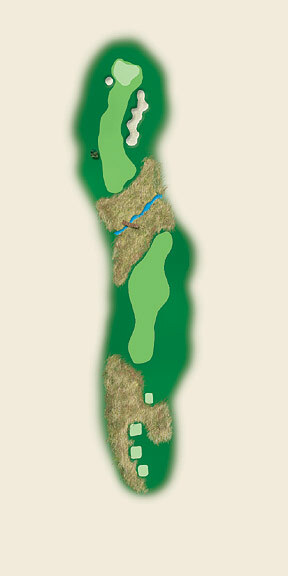 The approach shot is to a green that sits on a plateau and could be very difficult to hold. The uphill tee shot is to a generous fairway. 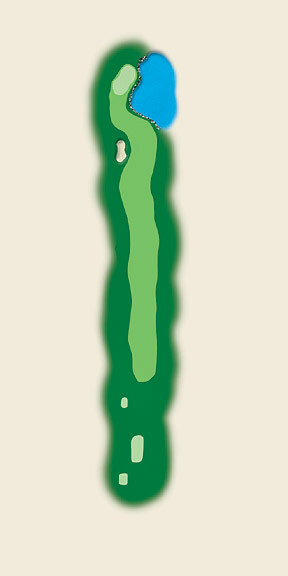 From there, the golfer must decide whether to lay up or go for the green in two. The lay up should be as close as possible to the bunker on the left. This will provide the better angle for the approach to the green, and reduce (or eliminate) the carry over the lake on the right. 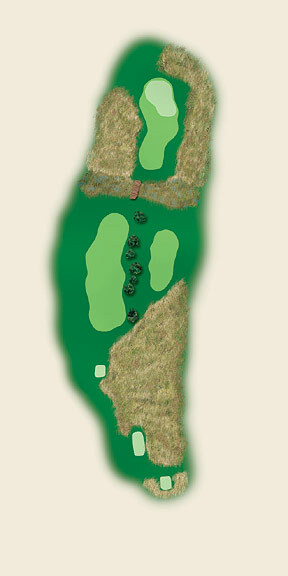 The only Par 3 with water sits in the middle of three great finishing holes. Club selection is crucial on this hole. The middle to long iron is to a narrow green with the lake up close to the entire right side and two bunkers behind. A mama mia of a finishing hole. This alternate route hole features a bisected fairway. To lay up short on the left and into the nose of the fairway, you must carry the bunker to provide a welcoming angle into the green. Try to carry the nose and you could gain 20 to 30 yards of additional roll. A drive to the right is open, inviting and safer, but leaves an additional 50+ yard carry to the pin. The rock walled green is nestled across the creek among massive beech and oak trees, and rests directly below the clubhouse.